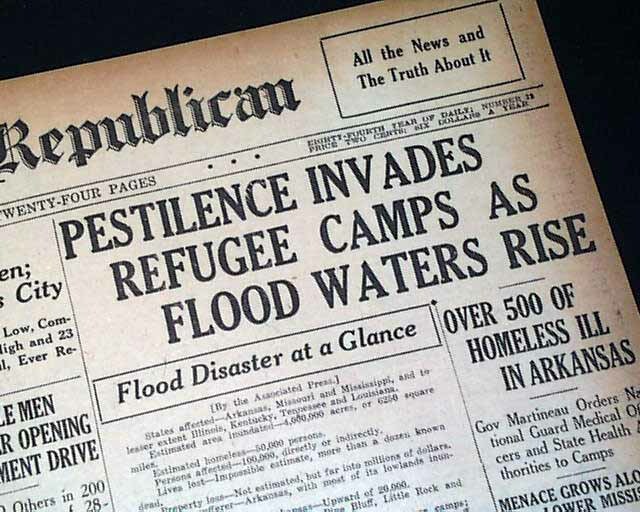 This 24 page newspaper has a three column headline on the front page: "PESTILENCE INVADES REFUGEE CAMPS AS FLOOD WATERS RISE" with subheads (see photos). Other news of the day including period advertising. Light browning with little margin wear, otherwise in good condition. wikipedia notes: The Great Mississippi Flood of 1927 was the most destructive river flood in the history of the United States. 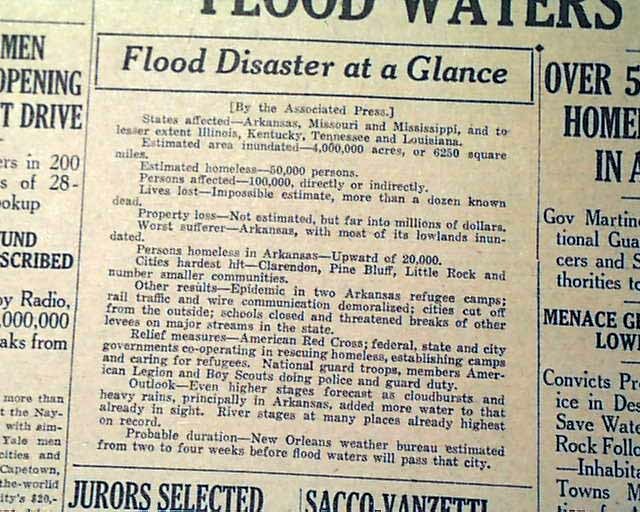 The flood began when heavy rains pounded the central basin of the Mississippi in the summer of 1926. By September, the Mississippi's tributaries in Kansas and Iowa were swollen to capacity. 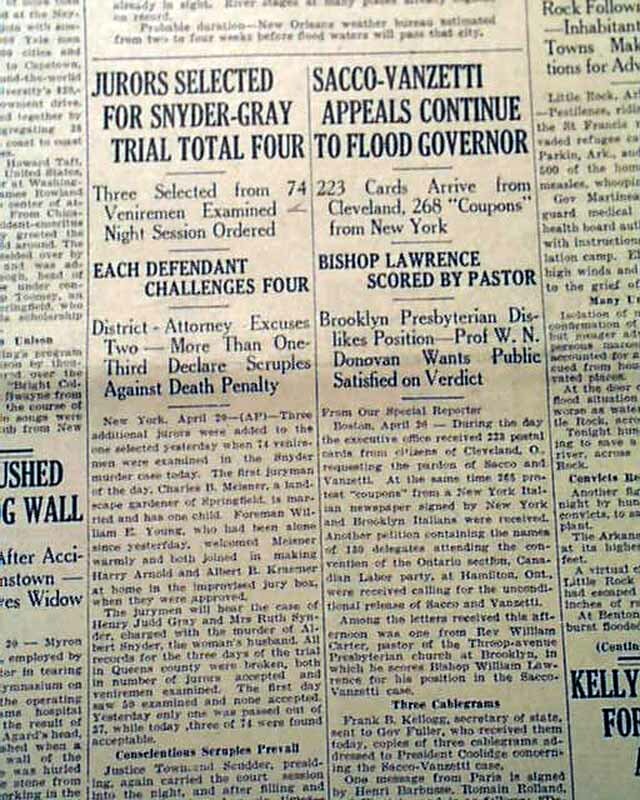 On New Year's Day of 1927, the Cumberland River at Nashville topped levees at 56.2 feet (17 m). 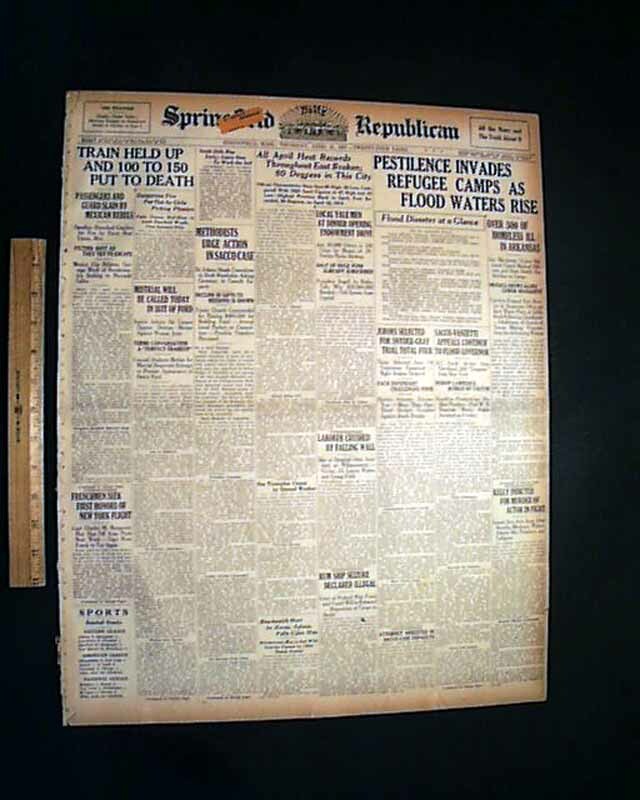 On April 15, 1927 15 inches (380 mm) of rain fell in 18 hours. This rain caused flooding which overtook the levees causing the Mounds Landing to break with more than double the water volume of Niagara Falls. The Mississippi River broke out of its levee system in 145 places and flooded 27,000 square miles (70,000 km2). This water flooded an area 50 miles wide and more than 100 miles long. The area was inundated up to a depth of 30 feet (10 m). The flood caused over $400 million in damages and killed 246 people in seven states. 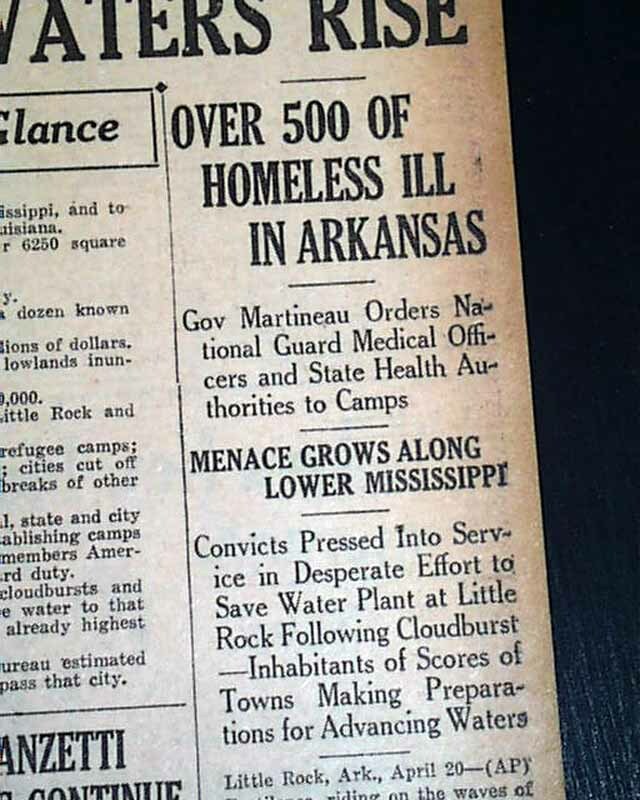 The flood affected Arkansas, Illinois, Kentucky, Louisiana, Mississippi, Missouri, Tennessee, Texas, Oklahoma, and Kansas. 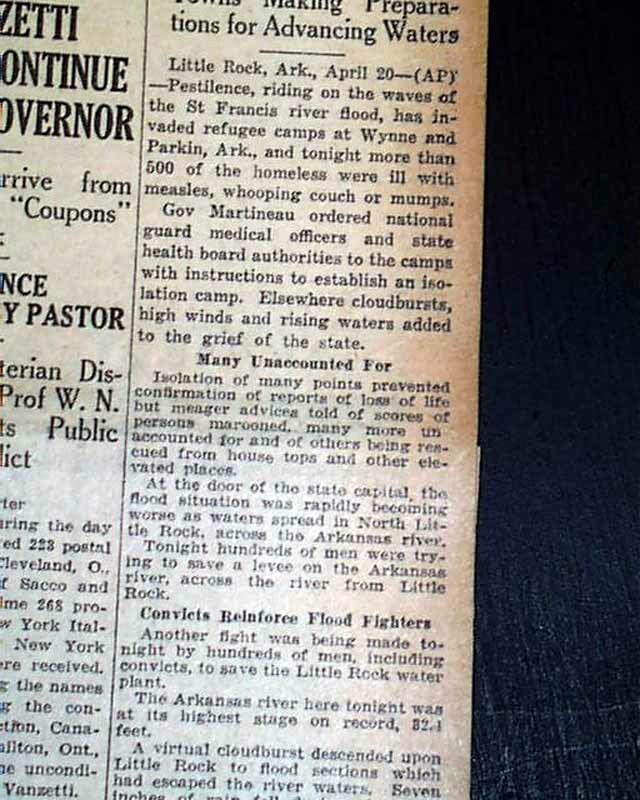 Arkansas was hardest hit, with 14% of its territory covered by floodwaters. By May 1927, the Mississippi River below Memphis, Tennessee, reached a width of 60 miles (97 km).